Justice in domestic courts is one of the most prominent aims of victims seeking to obtain accountability for human rights violations. It is, however, also one of the most difficult to achieve. In many Latin American countries, as well as elsewhere, activists have put human rights prosecutions forward as a fundamental means to end impunity, build democracy, strengthen the rule of law and address victims’ rights. But there is still little knowledge about what actually happens when these judicial mechanisms are effectively put to work. Can prosecutions of mass human rights violations contribute to overcome the effects of state violence and impunity? Can trials enable meaningful reparative changes for victims in their local contexts? Analysing the human rights trials in Argentina established to prosecute those responsible for human rights violations during the military dictatorship, this book addresses how and why domestic prosecutions can operate as a means for reparation and contribute to dealing with the damage caused by crimes against humanity. 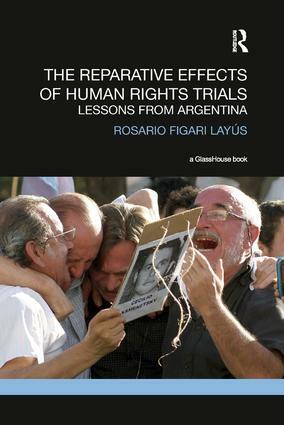 Based on a series of interviews conducted with victims participating in these prosecutions, as well as with lawyers, prosecutors, judges and other relevant actors in five provinces of Argentina, this book will be of considerable interest to those studying and working in the interdisciplinary field of transitional justice and human rights. The PhD thesis on which this book was based was awarded with the 2016 Doctoral Studies Award of the Philipps University of Marburg in Germany.